Video Dynamics offers a wide variety of solutions to meet the rapidly evolving demands of both government clients and commercial solutions. We design and maintain single rooms to entire campuses depending on the scope of work. We have established and maintain proficiencies in multiple A/V disciplines to include VTC (Video Teleconferencing), BDS (Briefing & Display Systems), Broadcast Productions including non-linear editing, Television Head Ends (both digital and IP), Video and Audio distribution, recording and playback. We offer to each client an on-site survey to capture requirements and detail the physical conditions of the space. This affords us the best opportunity to engineer a solution that is an ideal match for our customers. After installation is completed we work with our customers to validate VTC circuits and pass certification requirements established by most networks. We include a hands on training session to make sure that the end-users are comfortable with everyday operations. As a final step we provide a comprehensive drawing package for future needs. Our clients?mary focus is VTC (Video Teleconferencing) and BDS (Briefing & Display Systems). Video Dynamics has engineered a product with a common set of requirement as collected by multiple clients. The end result is a ?ries宩t capable of VTC (Tandberg), BDS (including PCs, TV, Blu-Ray). 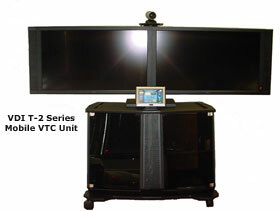 The unit is available in single or dual screen along with a variety of monitor sizes. To see the full details and capabilities of this product line please review the Data Sheet.